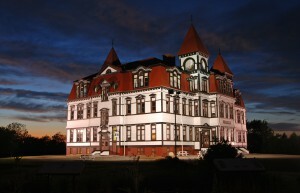 The Lunenburg Academy is one of the town’s most cherished structures. Designed by noted architect Harry H. Mott and built by local craftsman Solomon Morash, the Lunenburg Academy accepted its first 650-plus students on 7 November 1895. It was a state of the art facility of its time, with a central heating and ventilation system that provided comfort to the Academy’s three floors. Its six classrooms per floor were flooded with natural light from its large windows, and the principal office was connected to all floors through electric bells and speaking tubes. Calling the pupils to class was the 656-pound bell made by the Lunenburg Iron Company. 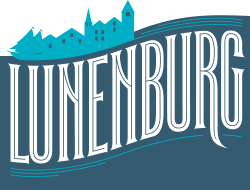 Just as it was for the hundreds of students travelling by train or coach from the county, the Academy is a grand introduction to Lunenburg. Sited on one of the peninsula’s highest points, the three-storey Academy increases its prominence through its four towers and ornate mansard roof details. These are continued to the other levels and accentuated at the building’s entrances. The Academy is still very much the ‘Castle on the Hill’ today that it was for generations of Lunenburgers. The Academy is the best preserved remnant of the prestigious academy system of education in Canada, and most of the interior is unchanged from its original appearance. The building’s wood construction is significant, not only because it continues Nova Scotia’s architectural traditions, but also because it reflects the local preference for wood construction and the design aesthetic of the Second Empire style. The Academy was Lunenburg’s first structure to be recognized as a National Historic Site of Canada, and is also a designated Provincial and Municipal Heritage Building. It closed as a school in 2012, but is maintained by the Town of Lunenburg, who are supported in their conservation efforts by the Lunenburg Academy Foundation, a dedicated group of the school’s alumni.